One of the oldest settlements in Madison County, Mecca was originally in what was Grimes County. A post office was opened in 1894 and closed in 1907 when mail was routed from Normangee. In 1896 the town had a population of about thirty, slowly growing to 50 by 1933. In 1935 the three-room schoolhouse had three teachers and thirty-seven white pupils. Most black pupils in district went to Chapel Hill School, three miles distant. Mecca's school merged with the North Zulch ISD in the 1940s. The town used cemeteries in neighboring Tenmile and Rock Prairie for interments and while the population remained at fifty into the late 40s, the town reported only six residents for the 1990 census. "The signs are all I saw of Mecca. 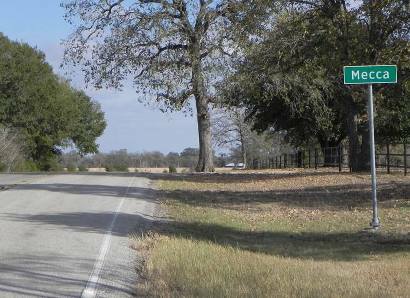 It is on FM 978 about 4 miles SE of Normangee."